The MP704 works in conjunction with an external power brick which brings a DC power lead up to the rear of the display. Interestingly enough, the patch cables are all white, and not the standard black. Other than that there really isn't too much to take notice on the MP704 - the unit has a clean front with a five button control panel, and a pushbutton power button with green LED. 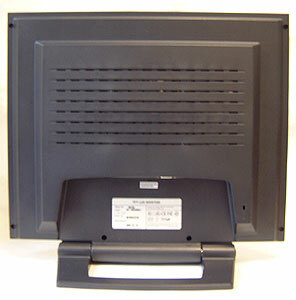 The rear of the monitor is vented to prevent over heating and while there is a kensington security lock hole, the stand is not removable for wall mounting. 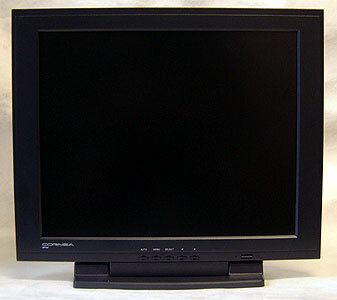 The monitor is relatively portable as the stand will fold up or down for storage, or shipping. This could be useful if the unit were being used in conjunction with a travelling presentation as the unit would store in a space roughly 3" thick. 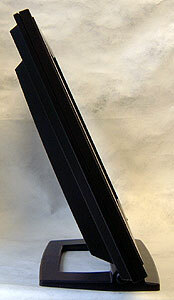 The stand will allow the MP704 display to tilt just 2 degrees forward, and up to 90 degrees backwards. Given the rather shallow up/down viewing angles you would see some image loss if things were tilted too far back. The left and right viewing angels are not the widest, but they are sufficient for most environments. 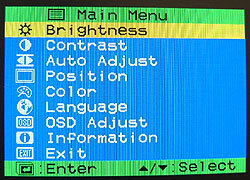 Digital products such as LCD monitors should really come with on screen menus a touch better than those of CRT's, but for most they are merely equal. The OSD on the Cornea MP704 is pretty standard stuff and there really isn't anything that stands out from what we have seen in other manufacturers offerings. It works well, and is easy to navigate so that is the most important point to consider. The auto adjust button is placed right on the bezel which makes it even easier to just push the button and allow the display to adjust itself to the ideal settings.